Posted by abi in youth ministry. Last Sunday I led 15 high schoolers and 2 other adults on a mission trip to Cincinnati, Ohio. I had everyone get to the church on Sunday morning at 5:30am to load up and was surprised when we got out and on the road by 6:15am! We had a pretty good and uneventful (8+ hour) drive there and got to our host church at 3:30pm. There were 7 other youth groups there from all over – New Jersey, Massachusetts, Indiana, and Canada. The mission trip organizers had some great service project for us to do all week! Some of the different types of projects were: helping to stock a food bank/serve meals to hungry people; volunteering at a special needs camp for kids of all ages/all disabilities; cleaning up/fixing up a church whose congregation is 50% homeless people – the church wanted to put in bedrooms for the homeless people to sleep in when needed; packing care boxes to send out through an international relief center; playing with underprivileged kids at a Boys and Girls center; fixing up a nature trail; hanging out with senior citizens at an adult day care center; and working at a church program with inner city kids. We were split into 15 different crews and sent out to serve on Monday. On Monday I was leading a crew that was sent to the special needs camp – I was able to help the youth understand a little more about special needs and how to work with the kids since I had worked in special ed before. I also was able to use my (rusty) sign language to help out with a disabled teen who was deaf. We had a great first day and then went back to the host church for dinner…..then the director of the mission trip program came up and asked if I was one of the youth’s leader. That’s never a good thing to hear. But it wasn’t because the youth had done anything wrong, just that they had found out that one of my youth had lice. They had been checking them because the Boys and Girls Club they were working at had a kid who had been found to have lice so they checked all the youth when they got back. So I had to call that youth’s parent to find out if it was ok to treat her. We started checking all the girls who were sleeping near her and then my whole youth group and found out that 13 out of 18 of us had lice – including me and the other adult female chaperone! Yuck! Then they started checking everyone and found out that there were about 40 people out of 92 who had lice! Which is just crazy…..usually when a kid at school gets it, only a few other kids catch it from them. But when we sleeping on the ground in such close quarters, I guess it spread more quickly. I think it was our rental van – since our group had the most, it seems like we may have very well started it and none of my youth’s siblings had it back home. I don’t know how else we would have gotten it and spread it around so quickly except for the 8 hour long van ride there. Oh well……all of the adults had to start shampooing and picking out the lice and then myself and the few adults (and we took a few youth who had lice to help us out) who had gotten lice took all the lice-y pillows, sleeping bags, and clothes to a 24-hour laundry mat and were there until 2:30am. I was really afraid that we weren’t going to be able to get the sleeping bags dry, but thank goodness for those huge fast dryers! We got back and some of my older high school girls were doing a great job helping out and cleaning lice rooms for people who had already been shampooed so that no one would catch it again. Myself, our other adult leader, and about 6 of those girls were the last ones to get our heads washed and after being up all night long, we all finally went to bed at 6am that morning and tried to get a few hours sleep. It was quite the ordeal – mostly just because of how many people were infected. They even brought out a lice specialist (go figure? what a job) from the health department of Cincinnati to come and make sure we had gotten all the lice the next day. She gave us quite the education on lice….more than I think I ever want to know. We did do everything right though and were all declared lice-free. (above) Me and my high school girls at 5:30am – finally lice-free! We couldn’t go back to work on project sites on Tuesday, but instead did some more laundry and gave our youth group a fun day of dinner at White Castle and we all went to see a movie – The Dark Knight. We had a good time and I only fell asleep a little towards the end when I kept thinking that the movie should be finishing anyway (my movie review in a nutshell: not bad, but too dark for me and too many endings/things happening at the end). On Wednesday morning, they asked if I could switch crews and be the adult leader for another crew (whose adult leader had been a little ridiculous and left with his daughter because he was upset about the lice fiasco). That crew of youth was serving at a church who was doing a day camp for 50-70 inner city kids from a rough neighborhood. The man (named Gordan) who was running the camp was absolutely incredible – he had such a heart for those inner city kids and was so passionate about the Lord. Gordan taught me the most of anything that week and had a powerful influence on the youth who were serving there. I had one youth from my church on that crew and I don’t think he had ever met anyone so passionately in love with his Savior before. We started each day with some great worship and prayer – for about an hour – he wanted us to all make sure that our hearts were ready to serve before the kids got there. And it made such a difference! Those kids were starved for attention and loved having us there, but they were also really learning about God. Gordan was teaching them doctrine and those kids were getting it! I was blown away by how much they remembered from week to week and how they could spit out answers so quickly. It was really amazing and God is really working in that place. lately I have been forgetting a lot of things….and feeling a bit like I’m drowning, but oh well. I had a great time with the youth and had a bunch of high school girls in my room late every each night talking to me. I am going to miss all these students (and their parents and everyone else at this church) a lot! They’re all pretty upset with Andy for proposing and making me move down to North Carolina with him. But they are happy for me…..they just don’t want me to go. I’m praying that they find a great new youth leader and that I can transition and leave well. Posted by abi in life, youth ministry. This weekend was slightly a blur. A good blur, but a blur nonetheless. Friday was a relaxing night in with the boyfriend over for dinner. Even though he’s going through a lot right now, we both just had a great time relaxing together and not doing or thinking about much of anything. Saturday morning I had good intentions of getting to the gym…..but didn’t wake up until after 10am….so it didn’t happen. I had lunch with my artsy friends, Jennifer and Alex. Alex was in town for Thanksgiving during her off-shift (she works at a wilderness therapy place down in the mountains of NC) and always has great stories. This time was no exception – she was telling us about the girls she works with and how she was recently stalking Ani Difranko in Ashville. Good times. Then Jennifer and I went to a bridal shower for a girl from our Bible study. Made it home just in time to go grab dinner with boyfriend and head over to another one of my high schooler’s plays – Romeo and Juliet. After church on Sunday, I met with my 2 parent volunteers to go over scheduling and events for spring. It was supposed to be a brief meeting, but ended up being nearly an hour and a half. It was good to get so much done though and we were all glad we had taken the time to get it (mostly) squared away now – before all the holiday craziness. I’m excited about what we have planned – but it also a little intimidating, because I know its a lot more than I did last year and going to be a lot of work. But I think it’s still all manageable. Especially when, as we are leaving both the parent volunteers start divving up all the tasks, such as scheduling, emails, getting parent chaperones, etc. – so that I can simply plan and run the activities and be there for the kids. Which is great – because the details are what bog me down. – In January: my Bible study group of girls (young adults in our 20s-30s) wants to do a sleepover for my youth group girls where we share with them some of the things we’ve recently been studying about women of the Bible – maybe focusing on Esther and watching the movie “One Night with the King”. I think this will be a really neat thing – I love to expose my youth to young adults who are living their faith – since there are very few young adults at our church right now. – In February: 30-hour Famine – which will be another first for this church. The youth have been begging to do a lock-in and I decided if we were going to do one, it may as well have a good purpose! And I just think it will be a good, new experience for them in fasting and thinking about hunger in the world. – In March: The youth have annually cooked, served, and provided entertainment for a fancy dinner to the senior citizens in our church. It’s a favorite event for both the youth and the seniors. – In April: Our church’s annual youth group retreat. It was an incredible time last year – and a first for me to plan/write material for the whole retreat weekend. A lot of work, but very worthwhile. – and we’re gearing up for our second High School mission trip. And I’m really excited because I already have a parent chaperone on board! Last year I was begging and God provided at the last minute – this year I’m really praying for more youth and we’ll need more chaperones…. It was a “big” youth group night (middle and high) – Sunday Night Live – this week. And I had been praying about it and had done a little thinking/planning during the week. I had a vague idea about the scripture point and thought illustrations through enough to know that I was going to play some games and do some activities with newspaper – so I had spread the word to parents to save their recycling for us. But that was about it. I unfortunately waited until Sat. night/Sunday to do most of my planning. But it surprisingly didn’t take long to come up with the programming and talk for the night. I was kind of amazed and wondered if I was slacking off and not going as deep or interesting as I used to…but after the night went off well, I realized that maybe I’m just getting better at it. What used to take me days and days to think through just to come up with the ideas, then setup the details hours and hours ahead of time….seemed to have taken me so much less stress and time this week. I guess I know a lot better how to plan activities that will last long enough, but not too long, know my youth well enough to know what they will “get” easily and what they won’t, and just am a lot more comfortable with it all. We ended up playing games and making snowmen out of newspaper. Then finding happy vs. sad stories and talking a little about them. We talked about advent and Angel Gabriel bringing the “good news” and then they dramatically retold the Christmas story using newspaper costumes and different themes. Sounds a little cheesey – but I’ve got a pretty crazy bunch that likes that sort of thing. We did some worship and I read them the lyrics from the song Rebel Jesus by Jackson Browne (Bebo Norman recently did a neat cover of it on his new Christmas album). We discussed the song and their thoughts about the Christmas season. Yesterday night was our once a month “Sunday Night Live” which is a bigger event night, combining middle and high school students. It is also more outreach focused and I encourage students to bring friends who don’t normally come to church. Unfortunately, since I had been sick, I hadn’t planned as much or as well as I usually do…but it went pretty well anyway. God is good. We did a “Choose your own adventure” themed night, talking about how to make wise choices. I had a series of choices where they could pick the games, activity, and how they wanted to help with worship. It was slightly chaotic, but fun, and I enjoyed hearing their thoughts and discussion. I’m just always amazed at how God can use us even when we’re weak and unprepared. Oh and the one student whose mother recently died is doing pretty well – we talk regularly and she’s trying to figure out what a new “normal” is for her and her family now. But her faith is strong and she’s still really wanting to come and be involved as a student leader. I gave her a blank sketchbook and crayons after the funeral and instructions on praying in color (see earlier post) as something she could use as an outlet to pray, get out what she’s feeling, or whatever. She has been telling me that she’s really liked it and she brought in the book by Sybil MacBeth that she just found at her local library to show me. I thought that was pretty cool and am glad that its helping her out. what a depressing day. It’s amazing what a gray rainy day can to do your attitude. I guess it doesn’t help that I feel so completely emotionally, physically, and spiritually drained from everything going on this week. That and morale around our office is low because our company screwed up our paychecks and all of us with direct deposits won’t see any money in our accounts until Monday. I didn’t have any big plans or bills I was paying this weekend where I am hugely affected by it thankfully, but it is still depressing when you count on getting paid, but then don’t. Oh well. I’m looking forward to sleeping in on Saturday morning for the first time in quite a while, not having many church responsibilities on Sunday, and hanging out with some good friends and my family. Posted by abi in life, ministry, youth ministry. Praying in Color is a prayer exercise I recently learned at a youth leader get together with my presbytery. It’s a neat, emergent-type of thing. There is a book by Sybil MacBeth called: Praying in Color: Drawing a New Path to God that explains it more fully, but basically you color while you pray. You can pray for people by writing their name or using a color to represent them and just doodling as you meditate or pray silently. You don’t have to be a good artist or worry about it looking good – the important part is the process and letting it help you focus on God. I liked the idea of praying in color a lot, since I’m an artist, and also into art therapy, but I wasn’t sure when I would use it in youth ministry. This weekend however ended up being the perfect opportunity. I knew Sunday morning was going to be hard on everyone. And the student whose mother died actually ended up coming to church. I knew she didn’t want to talk a whole lot about it, but we needed to somehow acknowledge the death and let everyone process it in some way. So I started high school Sunday School out by just mentioned all that had happened that week and how rough it all was. I told them that we were going to pray for the student’s family and all those who had lost someone or been impacted by death this week. But we were going to do that by praying in color. I handed out paper and crayons and told them what it was about – also that they could choose not to color, just to please stay quiet and respectful of those who were. It went really well – they were all so intent and focused that we continued praying and coloring for about 15 min., then I ended with “we lift all these prayers up to you Jesus. Amen”. It was a good, therapeutic way for us as a youth group to process the death of the student’s mother. And I think it’s a great way to try praying at other, not so tragic times. Some students will be more helped by it then others, but its worth trying with everyone once I think. Hope it helps you as much as it has me. This weekend was not a typical “fun and crazy, I love what I do” youth ministry weekend. As I drove up to the hospice on Saturday evening to visit one of my students whose mother had just been admitted, I thought about that fact. People preparing to be pastors know that they are eventually going to have to do funerals and a lot of bereavement counseling. I think going into youth ministry we don’t think as much about that side of things – because we sincerely hope that we won’t have to deal with hospice visits and funerals. We don’t want death to hit our students as much as it would the total congregation of a church with many older members. But it unfortunately does. I arrived at the hospice just hoping to show up and let my high school student know I was there if she needed anything and say a quick prayer and leave since her mother had just been moved there and I wanted to make sure I wasn’t intruding on family time to say goodbye. I really didn’t know her parents very well since this student had been invited by a friend to our youth group last year and had been coming faithfully on her own for the past year. I had a few brief interactions with them and when we found out her mother had cancer our church reached out to them in whatever way possible with meals, rides, and prayers. But the pastor of our church didn’t know the student too well or the family at all, so I decided that I needed to be the church representative and go visit at the hospice. I got there about 45 minutes after the mother had died. Walking into a room with a dead body is not what I think of as youth ministry. But being able to hug a student who was in shock, but also kind of shocked to see that I cared that much IS. Then I just sat there silently with them. After a while they asked me what to do (I had no clue really) – I said I would do whatever they wanted or needed. I said a prayer and the father asked if our pastor would be willing to do the funeral service even though they weren’t members of the church. I assured him that we had been praying for their family for a long time and that I knew the pastor would be happy to do it if he was available. Then I helped them make a few phone calls and left when another group of the family came so that they could grieve together privately. I felt very overwhelmed and ill-equipped to handle it all. But God helped me get through it and I was also thankful for my pastor-boyfriend support and advice, as well as my mother’s (she’s been a hospice nurse for years). As hard as it was, I was glad I went, because it somehow helped that I was there. My high school student called me at about midnight that night and thanked me for coming and she started to talk a little bit about how she was feeling. There were long pauses and she didn’t want to talk much about it….but I was glad that she realized that she could call me whenever she needed to. That’s what ministry is about – maybe more than the hyped up, amazing, worship-full events with tons of youth. It’s about walking with students through all seasons of their lives – especially the dark ones. so it’s finally Friday. This has been a long and busy week. A lot going on, lots of thoughts, worries, prayers. I was thinking about the last post on movies and it seems like more of the problem I was having was the big age/maturity difference in middle schoolers. I love middle schoolers and love working with them. But the more I do, the more I see that there is a HUGE difference between a 6th grader and an 8th grader. It’s hard to shoot for the middle ground without feeling like you’re either not exposing young 6th graders to too much or alternately, not reaching 8th graders with what they need to be hearing. I’m still working on a movie and movie clip policy – and asking parents and my pastor for advice. Any thoughts on how to best help middle schoolers and/or thoughts on movie policies for youth ministry? I am worried about quite a few people in my life right now. I have a few friends dealing with some hard stuff, also still concerned for my sister and all she has going on in her life. Several of my high school students just had a coach die tragically in an accident, and one of those same students is dealing with a parent who has cancer – which is unfortunately getting much worse. I don’t really know how to help in many of these situations, except to be there for the people involved and be praying like crazy for them all too. It’s in my nature to be a peacemaker and try and “fix” things. But I can’t fix any of this, as much as I might want to. Tonight I am glad that I get to go home and relax. Boyfriend is coming over and I’m making dinner (I really like to cook when I have time and someone other than me to enjoy it!). I think I am fixing chicken pot pie – good, warm comfort food. And we’ll probably watch a movie from redbox….yep, sounds like a good night. This past weekend, our local presbytery held a retreat for middle school students. I went with one other adult chaperone and some of our middle schoolers and we all had a great time. It was nice to just tag along and not have to be involved with the planning or details – just provide adult supervision and have a good chunk of time to spend getting to know my youth better. Great theme – great verses. And the high school youth on youth council who were helping out did a great job of planning some workshops and discussion times that the middle schoolers enjoyed and got a lot out of. There was also a key note speaker who did a good job of conveying the importance of noncomformity and being transformed to be more like Christ. The speaker showed a couple of movie clips to help her illustrate her points – the clips caused a bit of controversy. 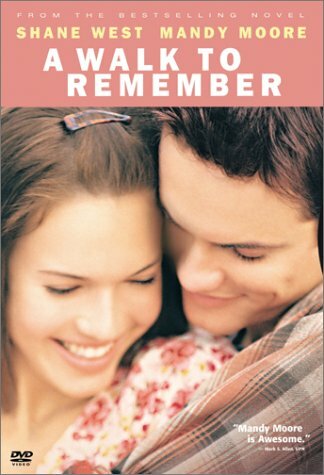 She showed the beginning portion of “A Walk to Remember” where one kid is trying so hard to fit in that he jumps off of a tower into shallow water and becomes paralyzed. That is definately a good example of someone trying to fit in – and how it comes at a high cost sometimes. Problem was that movie was rated PG-13 and in that beginning part there was a good bit of cussing and other stuff with the bad kids. While not horrible and the film overall has a good message, that clip was questionable. There was a younger girl in my cabin who had never seen the movie asking me later why we were showing a movie with so much cussing at a church retreat. I talked to her a little about it and she understood the point the speaker was trying to make. But I also didn’t know why we showed that particular portion of the movie (when there are other parts of that movie and other movies in general that could’ve illustrated the same thing with a little less language). 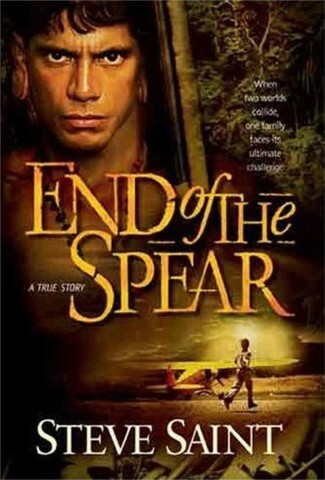 The next night the speaker showed a longer portion of the movie “End of the Spear“. It’s about the story of 5 missionaries who were brutally killed by the people they went to witness to and the dramatic change of how they ultimately ended up following Christ. It is an very well-produced and excellent movie – well worth anyone watching if they haven’t….but again PG-13. And the portions that the speaker showed were very graphic and violent – showing a baby and quite a few other people getting speared. I looked around the room and a lot of the youth were crying. The speaker made a dramatic point when she showed 20 mins. of that and then a portion closer to the end where the son of the missionary and the guy who killed his father reconciled. Yes that was a powerful story of transformation – but it may have been a little too much for younger middle schoolers. Some of whom had nightmares that night and were visibly upset. The speaker apologized to the adults the next morning and explained that she herself had let her kids watch those movies at the same age – but she also said she didn’t think about how young some of the students coming to the retreat would be and didn’t take into account how violent the one movie (End of the Spear) really was. I personally think that some middle schoolers could’ve handled it fine and it may be a good choice for them to watch – but maybe as a family so their parents could have the opportunity to discuss it with them afterwards. I think the speaker this weekend could’ve showed a lot less of both movies and told more of the story herself and that may have caused a lot of the adults there less concern. Also it wouldn’t have placed so many images in younger students who may not have been ready for them. What do you all think? Does your church have any type of standards about watching movies or even movie clips? Our church currently doesn’t have a policy, but I think now I may try and work with my senior pastor to put one in writing. Posted by abi in blogging, life, youth ministry. and I’m heading off to our Presbytery’s middle school retreat. It was a lot of fun last year and neat to get to know people from other churches. I think it will be a good time, I’m just struggling right now becuase I’m so busy – it’s hard to give up this whole weekend and be away….but oh well. I’m sure I’ll come back glad that I went and also glad for the opportunity to get to know some of my middle schoolers better. One of my goals is to figure out how to tell the indentical twin sisters apart (I have always felt so bad not knowing who is who – especially since I usually forget even when they tell me!). Another goal is not to break my foot this year! Capture the flag there is brutal…. I got a rubber chicken at a Christmas party playing the Yankee Trader game and figured it would be great for youth stuff. I saw that game idea somewhere and was pretty sure it would flop, but tried it anyway. We modified it slightly to what is posted on Tim’s blog, and now “Chuck the chicken” has turned into one of my students favorite games!